Someone who's quiet and patient. He's ready to play the very first unbalanced prototype over and over again without mourning. It's the stage of the game development when the designer has no clue how's the game is going to look like. Silent playtester is perfect at this point because they are not influencing your vision. At this stage, you want to avoid people who will rush you with millions of ideas. They can in a significant way change your vision. Most likely your partner will be this kind of person. For me, it's my wife, for Ignacy it's his wife, and for many other designers, it is their partner as well. As you got the cornerstone of your game and you have a rough idea what is your goal, you move to the next stage and start inviting creative playtesters. They will give you hundreds of great ideas. Probably 80% of them will be rubbish, and you'll chuck them away, but 20% will be worth testing. After your game is tested and you feel it is almost ready, it's time for the next group. When you playtest your game with smart, intelligent and clever players, everything looks like your game is well balanced. But then suddenly a crazy playtester sit to the table, and he plays your game the most stupid possible way. You would never expect anyone to have such a stupid strategy, but hey, he wins the game. And then another one. It's like winning Carverna by collecting only wood - non-stop! These testers help to find holes in the mechanic and eliminate "golden" strategies to win the game. Mathematicians are useful at the last stage of board game design. They can help you to balance the numbers, amounts, etc. in the game. I hope you enjoyed this entry and please have a look on Ignacy Trzewiczek's blog. To be honest, I never categorised my playtesters, but new lesson learned. How about you? 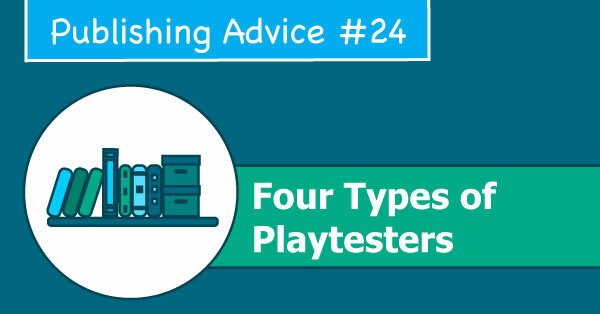 Do you categorise you playtesters?